A geologist is a fault-finder. Quoted in M. Goran, A Treasury of Science Jokes (1986),73. A woman who doesn’t fuss has no faults. Aphorism as given by the fictional character Dezhnev Senior, in Fantastic Voyage II: Destination Brain (1987), 95. After Gibbs, one the most distinguished [American scientists] was Langley, of the Smithsonian. … He had the physicist’s heinous fault of professing to know nothing between flashes of intense perception. … Rigidly denying himself the amusement of philosophy, which consists chiefly in suggesting unintelligible answers to insoluble problems, and liked to wander past them in a courteous temper, even bowing to them distantly as though recognizing their existence, while doubting their respectability. The Education of Henry Adams: An Autobiography? (1918), 377. Alfred Nobel - pitiable half-creature, should have been stifled by humane doctor when he made his entry yelling into life. Greatest merits: Keeps his nails clean and is never a burden to anyone. Greatest fault: Lacks family, cheerful spirits, and strong stomach. Greatest and only petition: Not to be buried alive. Greatest sin: Does not worship Mammon. Important events in his life: None. Letter (1887) from Alfred to his brother, Ludwig. In Erik Bergengre, Alfred Nobel: the Man and His Work (1960), 177. Bye's First Law of Model Railroading. In Paul Dickson, The Official Rules, (1978), 23. Experience is never at fault; it is only your judgment that is in error in promising itself such results from experience as are not caused by our experiments. For having given a beginning, what follows from it must necessarily be a natural development of such a beginning, unless it has been subject to a contrary influence, while, if it is affected by any contrary influence, the result which ought to follow from the aforesaid beginning will be found to partake of this contrary influence in a greater or less degree in proportion as the said influence is more or less powerful than the aforesaid beginning. 'Philosophy', in The Notebooks of Leonardo da Vinci, trans. E. MacCurdy (1938), Vol. 1, 70. From this time everything was copulated. Acetic, formic, butyric, margaric, &c., acids, alkaloids, ethers, amides, anilides, all became copulated bodies. So that to make acetanilide, for example, they no longer employed acetic acid and aniline, but they re-copulated a copulated oxalic acid with a copulated ammonia. I am inventing nothing—altering nothing. Is it my fault if, when writing history, I appear to be composing a romance? In Oeuvres de Frederic Le Grand edited by J.D.E. Preuss (1849), Vol. 7, 100. In Robert Édouard Moritz, Memorabilia Mathematica (1917), 310. I myself, a professional mathematician, on re-reading my own work find it strains my mental powers to recall to mind from the figures the meanings of the demonstrations, meanings which I myself originally put into the figures and the text from my mind. But when I attempt to remedy the obscurity of the material by putting in extra words, I see myself falling into the opposite fault of becoming chatty in something mathematical. Astronomia Nova, New Astronomy, (1609), Introduction, second paragraph. In this country all a man need to do is to attain a little eminence and immediately he begins to talk. Usually his eminence is financial, and the greater this eminence the more he talks and the further his voice reaches. I don't blame the rich people for talking; many of them don’t know what else to do with themselves. The fault is with these who listen. If no one would listen no harm would he done. But the American people are willing to listen to any one who has attained prominence. The main fact is that we've heard a man's name a great many times; that makes us ready to accept whatever he says. … We listen to the one who talks the most and loudest. It is an irony of fate that I myself have been the recipient of excessive admiration and reverence from my fellow-beings, through no fault, and no merit, of my own. The cause of this may well be the desire, unattainable for many, to understand the few ideas to which I have with my feeble powers attained through ceaseless struggle. I am quite aware that for any organisation to reach its goals, one man must do the thinking and directing and generally bear the responsibility. But the led must not be coerced, they must be able to choose their leader. In 'What I Believe', Forum and Century (1930), 84, 193-194. It is not the conscience which raises a blush, for a man may sincerely regret some slight fault committed in solitude, or he may suffer the deepest remorse for an undetected crime, but he will not blush... It is not the sense of guilt, but the thought that others think or know us to be guilty which crimsons the face. Julius Caesar Act 1, Scene 2, lines 139-141. Never, I believe, did a vessel leave England better provided, or fitted for the service she was destined to perform, and for the health and comfort of her crew, than the Beagle. If we did want any thing which could have been carried, it was our own fault; for all that was asked for, from the Dockyard, Victualling Department, Navy Board, or Admiralty, was granted. In Narrative of the Surveying Voyages of His Majesty's Ships Adventure and Beagle between the Years 1826 and 1836 (1839), Vol. 2, 43. Nothing that you do in science is guaranteed to result in benefits for mankind. Any discovery, I believe, is morally neutral and it can be turned either to constructive ends or destructive ends. That’s not the fault of science. Quoted by Jeremy Pearce in 'Arthur Galston, Agent Orange Researcher, Is Dead at 88', New York Times (23 Jun 2008), B6. Our ancestors, when about to build a town or an army post, sacrificed some of the cattle that were wont to feed on the site proposed and examined their livers. If the livers of the first victims were dark-coloured or abnormal, they sacrificed others, to see whether the fault was due to disease or their food. They never began to build defensive works in a place until after they had made many such trials and satisfied themselves that good water and food had made the liver sound and firm. …healthfulness being their chief object. In De Architectura, Book 1, Chap 4, Sec. 9. As translated in Morris Hicky Morgan (trans. ), Vitruvius: The Ten Books on Architecture (1914), 20. 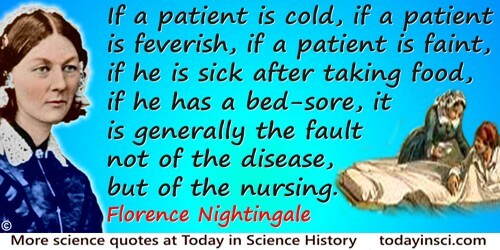 Physician's faults are covered with earth, and rich men's with money. In Adam Wooléver (ed. ), Treasury of Wisdom, Wit and Humor, Odd Comparisons and Proverbs (1878), 507. Physicians, of all men, are most happy; whatever good success soever they have, the world proclaimeth; and what faults they commit, the earth covereth. In 'Nicocles', Emblems, Divine and Moral; The School of the Heart; and Hieroglyphics of the Life of Man (1866), 404. Psychiatry enables us to correct our faults by confessing to our parents’ shortcomings. Roses have thorns, and silver fountains mud. All men make faults, and even I in this. That was the beginning, and the idea seemed so obvious to me and so elegant that I fell deeply in love with it. And, like falling in love with a woman, it is only possible if you do not know much about her, so you cannot see her faults. The faults will become apparent later, but after the love is strong enough to hold you to her. So, I was held to this theory, in spite of all difficulties, by my youthful enthusiasm. Expressing how his work on quantum electrodynamics began with an original idea. In his Nobel Prize Lecture (11 Dec 1965), 'The Development of the Space-Time View of Quantum Electrodynamics'. Collected in Stig Lundqvist, Nobel Lectures: Physics, 1963-1970 (1998), 157. The bells which toll for mankind are—most of them, anyway—like the bells of Alpine cattle; they are attached to our own necks, and it must be our fault if they do not make a cheerful and harmonious sound. From sixth and last lecture in series of Reith Lectures titled 'The Future of Man' on BBC Home Service radio (1959). Text printed in the magazine, The Listener. Also collected in book form as The Future of Man. This was the concluding sentence of the last lecture. The cases of action at a distance are becoming, in a physical point of view, daily more and more important. Sound, light, electricity, magnetism, gravitation, present them as a series. The nature of sound and its dependence on a medium we think we understand, pretty well. The nature of light as dependent on a medium is now very largely accepted. The presence of a medium in the phenomena of electricity and magnetism becomes more and more probable daily. We employ ourselves, and I think rightly, in endeavouring to elucidate the physical exercise of these forces, or their sets of antecedents and consequents, and surely no one can find fault with the labours which eminent men have entered upon in respect of light, or into which they may enter as regards electricity and magnetism. Then what is there about gravitation that should exclude it from consideration also? Newton did not shut out the physical view, but had evidently thought deeply of it; and if he thought of it, why should not we, in these advanced days, do so too? Letter to E. Jones, 9 Jun 1857. In Michael Faraday, Bence Jones (ed. ), The Life and Letters of Faraday (1870), Vol. 2, 387. The computer is a great invention. There are as many mistakes as ever, but now they're nobody's fault. In E.C. McKenzie, 14,000 Quips and Quotes for Speakers, Writers, Editors, Preachers, and Teachers (1990), 338. The United States at this moment occupies a lamentable position as being perhaps the chief offender among civilized nations in permitting the destruction and pollution of nature. Our whole modern civilization is at fault in the matter. But we in America are probably most at fault ... We treasure pictures and sculpture. We regard Attic temples and Roman triumphal arches and Gothic cathedrals as of priceless value. But we are, as a whole, still in that low state of civilization where we do not understand that it is also vandalism wantonly to destroy or permit the destruction of what is beautiful in nature, whether it be a cliff, a forest, or a species of mammal or bird. Here in the United States we turn our rivers and streams into sewers and dumping-grounds, we pollute the air, we destroy forests and exterminate fishes, birds and mammals'not to speak of vulgarizing charming landscapes with hideous advertisements. 'Our Vanishing Wild Life', The Outlook, 25 Jan 1913. In Donald Davidson (Ed.) The Wisdom of Theodore Roosevelt (2003), 19. To find fault with our ancestors for not having annual parliaments, universal suffrage, and vote by ballot, would be like quarrelling with the Greeks and Romans for not using steam navigation, when we know it is so safe and expeditious; which would be, in short, simply finding fault with the third century before Christ for not being the eighteenth century after. It was necessary that many other things should be thought and done, before, according to the laws of human affairs, it was possible that steam navigation should be thought of. Human nature must proceed step by step, in politics as well as in physics. The Spirit of the Age (1831). Ed. Frederick A. von Hayek (1942), 48. 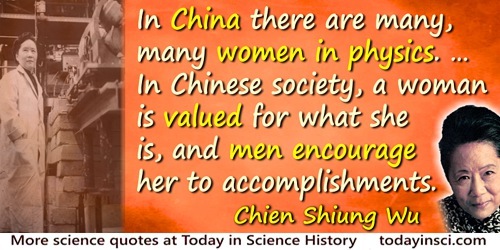 … it is shameful that there are so few women in science… In China there are many, many women in physics. There is a misconception in America that women scientists are all dowdy spinsters. This is the fault of men. In Chinese society, a woman is valued for what she is, and men encourage her to accomplishments yet she remains eternally feminine. Quoted in 'Queen of Physics', Newsweek (20 May 1963) no. 61, 20. “She can't do sums a bit!” the Queens said together, with great emphasis. “Can you do sums?” Alice said, turning suddenly on the White Queen, for she didn't like being found fault with so much. Through the Looking Glass and What Alice Found There (1871, 1897), 191.